All year long, the Thunder grinded it out to get to this point. 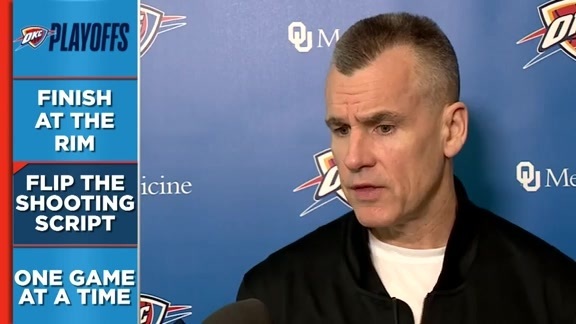 The journey of the season is an integral part of the story of each year, and Head Coach Billy Donovan’s club can look back with pride at navigating through incredible surges and rocky waters throughout the 2018-19 campaign. From the MVP-level performances of Paul George, to missing a pair of shooting guards for nearly the entire season, the Thunder had much to rally around as it made a push towards clinching a playoff berth. 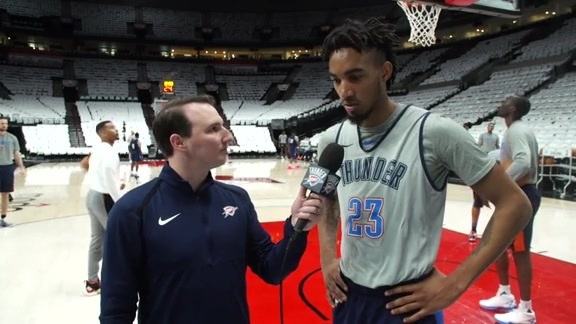 With five straight victories to end the season, the Thunder started getting the results it wanted on the scoreboard and secured the sixth seed in a competitive Western Conference. That means a first-round date with the Northwest Division Rival Portland Trail Blazers, a series that starts in Portland with Game 1 on Sunday afternoon. The Thunder likes how it is playing heading from Game 82 into the start of the first round. 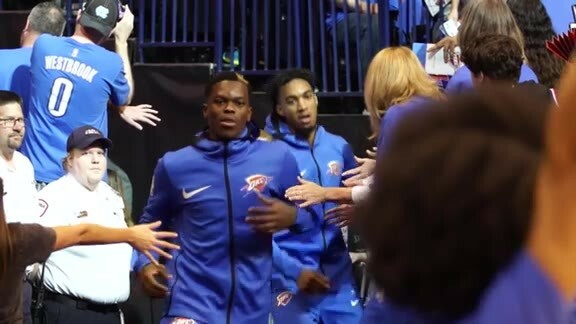 While the Thunder is encouraged by the finish to the season and the 4-0 record against the Blazers, it knows that the slate is wiped clean starting Sunday and it must execute at a high level for 48 minutes at possibly seven games. From the very beginning of the season, there was a clear winning window that the Thunder had to fit into each night. Donovan’s team had to capitalize on some key aspects within the game in order to give itself a chance to win. 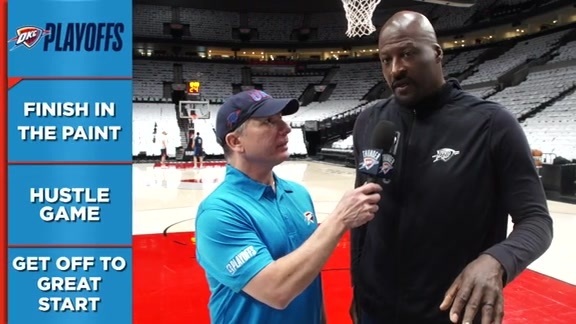 Those factors are listed below, along with the way they shook out in the Thunder season sweep of the Blazers in 2018-19. Transition Game: As the first part of the defense, the Thunder got back and walled off the Blazers during the season series, allowing just 10.5 fast-break points per game while scoring 21.3 fast-break points of its own. Three-Point Defense: The Thunder defense forced the Blazers into just 28.5 percent 3-point shooting on 34.3 attempts in the season series, despite Portland shooting 35.9 percent on 30.7 attempts overall during the season. Prevent Second Chances: During the season series, the Thunder allowed 13.8 offensive rebounds per game, which led to, coincidentally, 13.8 second-chance points for the Blazers. Limit Fouls: The Blazers attempted 32.0 free throws per game in the season series, including 47 in the most recent meeting on March 8. Turnover Differential: The Thunder turned the ball over just 12.5 times per game against the Blazers, while forcing Portland into 14.8 per game. Get Efficient Shots: While the Thunder was only able to manage 6.0 corner 3-point attempts per game against the Blazers, below league average, Donovan’s club did get 32.3 shot attempts in the restricted area per game, which is well above the mean. “Our team has done a really good job of moving and passing the ball,” Donovan said. Field Goal Attempts: All season long the Thunder led the NBA in field goal attempts per game with 94.0, but in the four-game season series, the Blazers attempted 0.3 more shots than OKC. 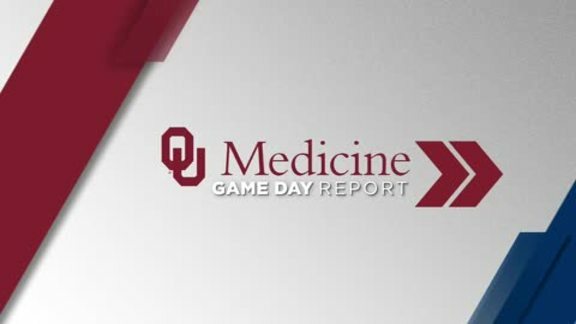 The x’s and o’s and the statistics always tell part of the story in a game or a series, but the team’s mental and physical approach will be crucial in this series as well. Despite being the lower seed and starting on the road, the Thunder faces a Blazers team who is missing Jusuf Nurkic, its star center who suffered a severe leg injury on March 25. The Blazers have won seven of nine games since Nurkic’s injury and went 14-3 down the stretch. Despite sweeping the season series, OKC’s four wins came by two, nine, nine and eight points, in an overtime game on the road. Those skinny margins, Portland’s late surge and the challenge the Blazers present all give the Thunder a healthy level of respect to go with its ever-burning confidence and competitiveness. “Those four games are out. This is where it really starts,” George said. “They’re going to make adjustments, we’re going to make adjustments, it’s going to be a whole new series against them.